Actually, I wanted to share this recipe earlier on my blog but somehow I couldn’t get around to it yet. 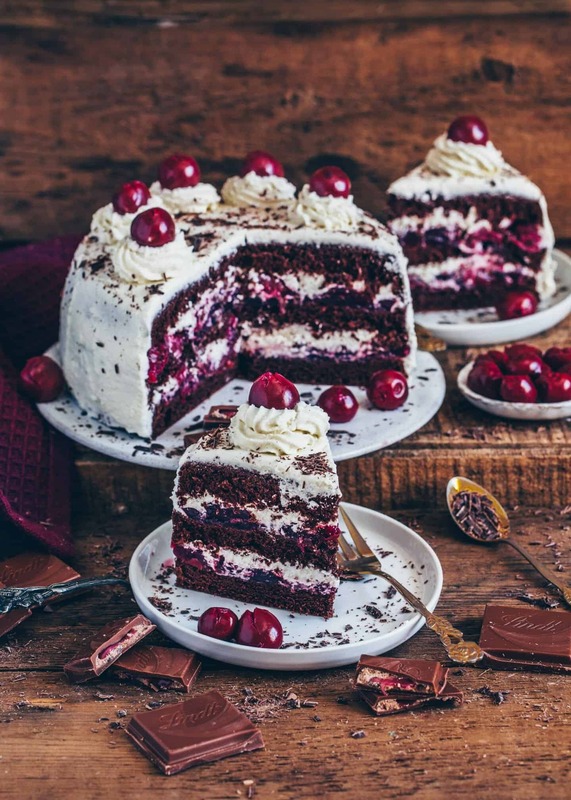 Usually, I’ve baked this Vegan Black Forest Cake for a birthday party or another festive occasion without photographing it first. 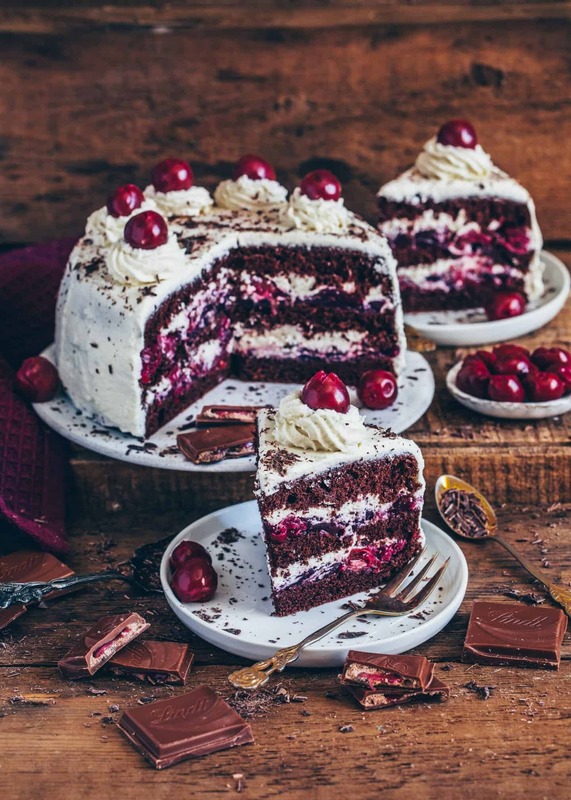 In fact, this cake is always very popular with guests, although it’s even vegan, made of plant-based ingredients and much healthier than regular chocolate cakes with creamy layers. I don‘t bake rich festive cakes for myself so often. Mostly, I make a simple Carrot Cake, Apple or Cherry Pie or my best healthy Banana Bread. 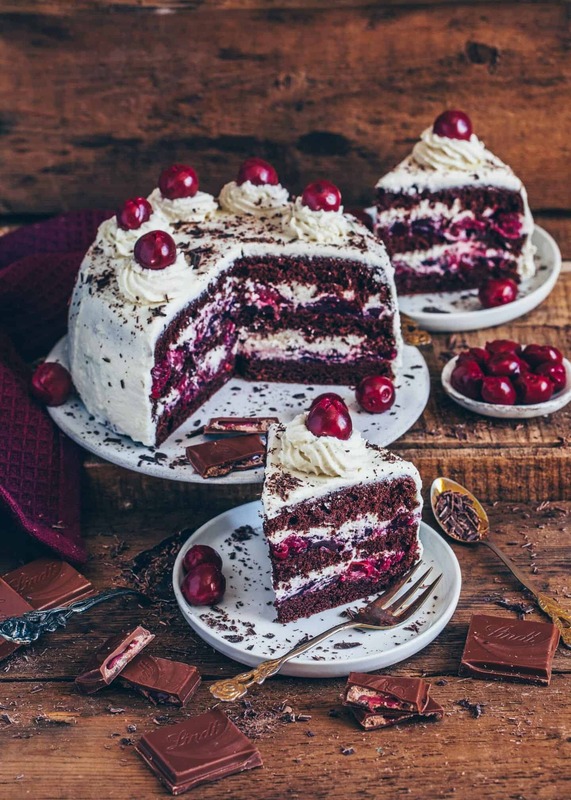 But if it should be a cake, then it has to be a Vegan Black Forest Cake! My family and I love this cake so much and we always serve it as dessert on Christmas. This cake tastes incredibly delicious! 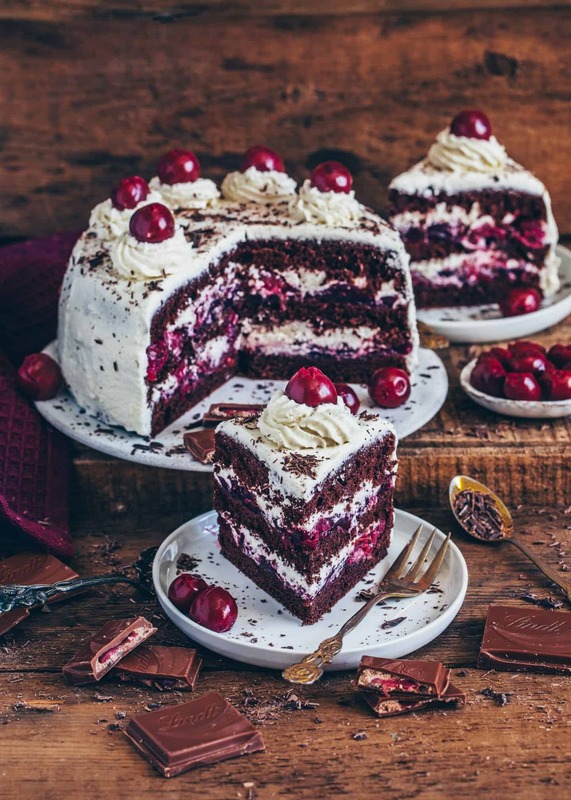 The combination of a fluffy chocolate cake, which contains no eggs and no dairy ingredients, plus fruity cherries and a light cream layer is absolutely heavenly. You only need a few ingredients and it‘s easy to make! 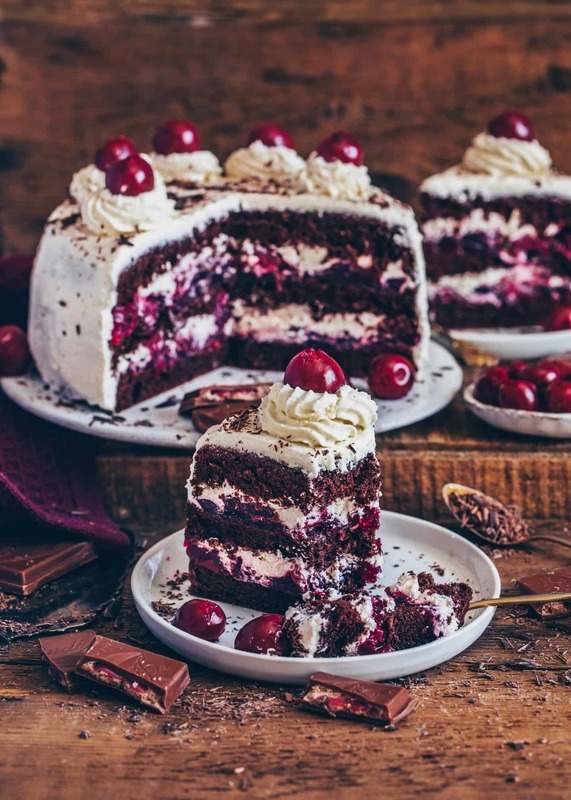 To make this cake, you don‘t need many ingredients and the best thing, it’s relatively easy to make! The batter for the chocolate cake comes together very quickly in one bowl. If you have three round baking tins, you could even bake three layers at the same time. Otherwise, you can bake the whole batter in one baking form and then cut it into three even layers. That’s how I do it. 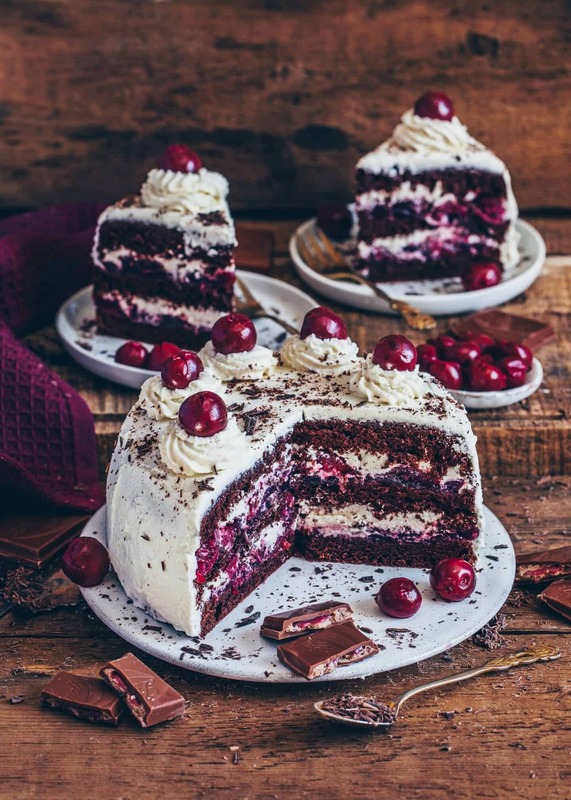 The filling is made of cherries from the glass (or canned) and whipped plant-based cream, which is also the frosting. You can choose whether you use regular cream or dairy-free cream. I always use this plant-based cream for whipping because it gets perfectly stiff. I don‘t know if this recipe works with coconut cream either because I haven‘t tried it yet. Can be made Gluten-free and Sugar-free. 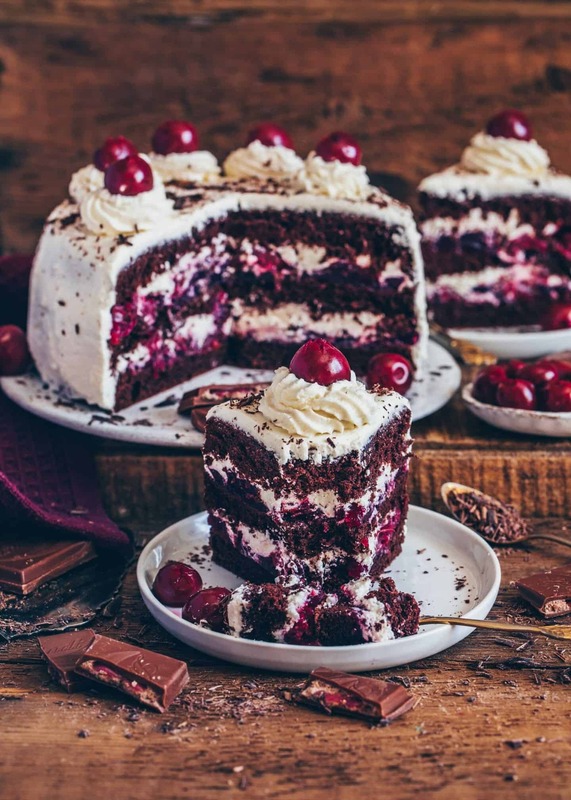 This heavenly vegan Black Forest cake is incredibly delicious and contains only plant-based ingredients. The recipe is simple and can be made sugar-free and gluten-free. 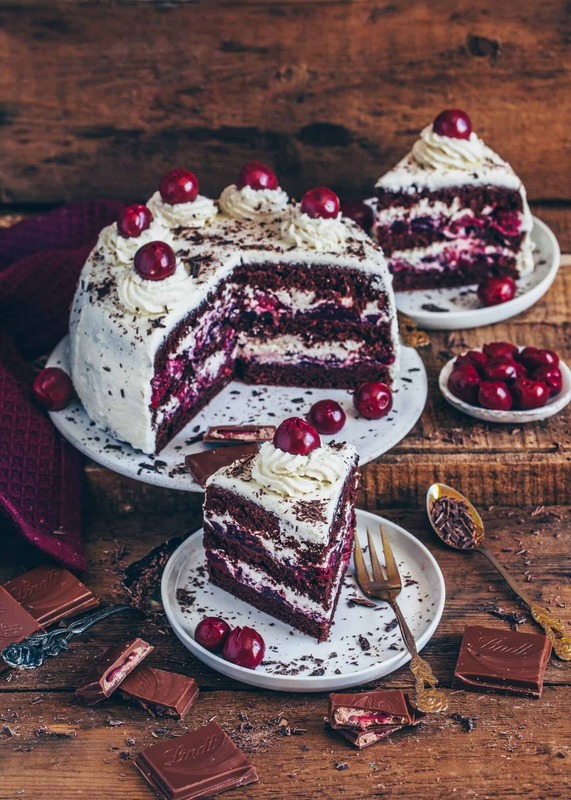 It's a perfect cake for a birthday or as a dessert for a cozy afternoon. Preheat the oven to 355°F (180°C) and line the bottom of a 7-inch round baking tin with parchment paper. Mix the flour, corn starch, sugar, cocoa, baking powder and salt in a mixing bowl. Add oil and sparkling water and mix with a whisk to combine, add the baking soda and apple cider vinegar last. Fill the batter into the baking tin and bake for about 25 minutes, or until a toothpick comes out clean. Allow to cool completely, then cut into 3 equal cake layers. (Optionally, you can divide the batter in 3 baking tins and bake for about 15 minutes). Drain cherries and collect the juice. Stir 2-3 tbsp of the cherry juice with sugar and starch. Bring the remaining cherry juice to a boil in a pot, stir in the starch mixture using a whisk and bring to a boil again while stirring constantly. Then remove from the heat, let cool a bit and gently fold in the cherries. Beat cream with an electric hand mixer on high speed for about 1 minute, then add cream stabilizer and continue beating until stiff. Refrigerate for at least 1 hour, until ready to use. Spread half of the cherry compote evenly on the bottom cake layer, then spread over a thin layer of cream. Top with the second cake layer, spread over the remaining compote followed by another cream layer. Top with the third cake layer and frost the top and sides of the cake with remaining cream (save a small portion of the cream for the decoration and fill into a piping bag). Pipe 7 rounds of cream on the top of the cake and place a cherry over each one. Sprinkle with grated chocolate and refrigerate cake for at least 1 hour- before serving. I use this plant-based cream for whipping. 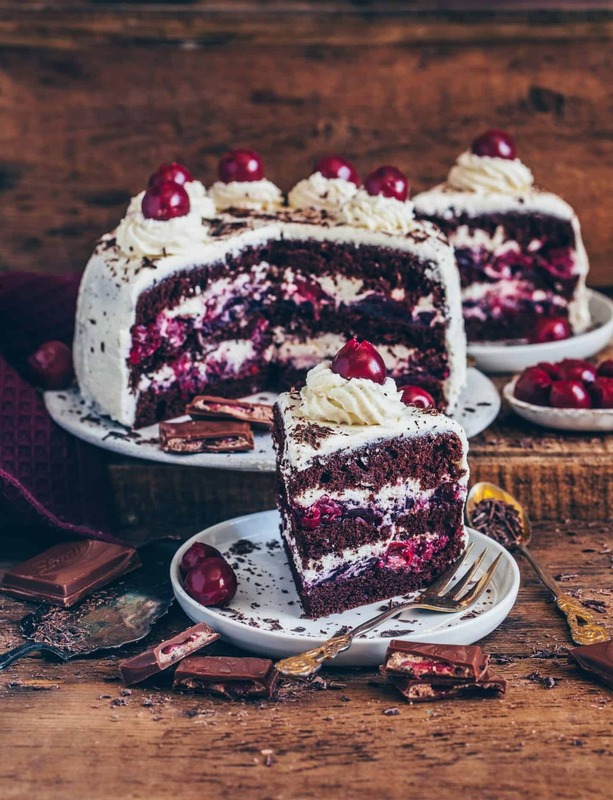 If you like the cake sweeter, you could use a sweetened plant-based cream or add more sugar or erythritol. The cake lasts for about 4-5 days in the fridge and is also great for freezing. * This post contains not sponsered advertising because the brand is visible. Hey, what the cream stabilizer is? I linked the products in the recipe notes and in the text. So glad that you like this recipe! Hi! The cake looks awesome! By any chance, do you have any advice about how to freeze it? 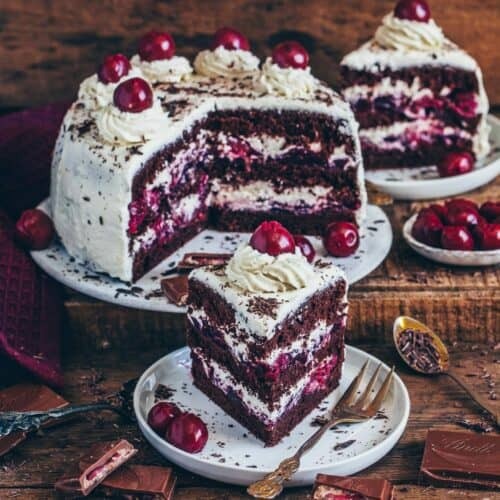 Should I freeze the layers and make the cream and cherry compote last minute? I’m afraid about freezing the entire cake, I don’t know how the cream could turn out. 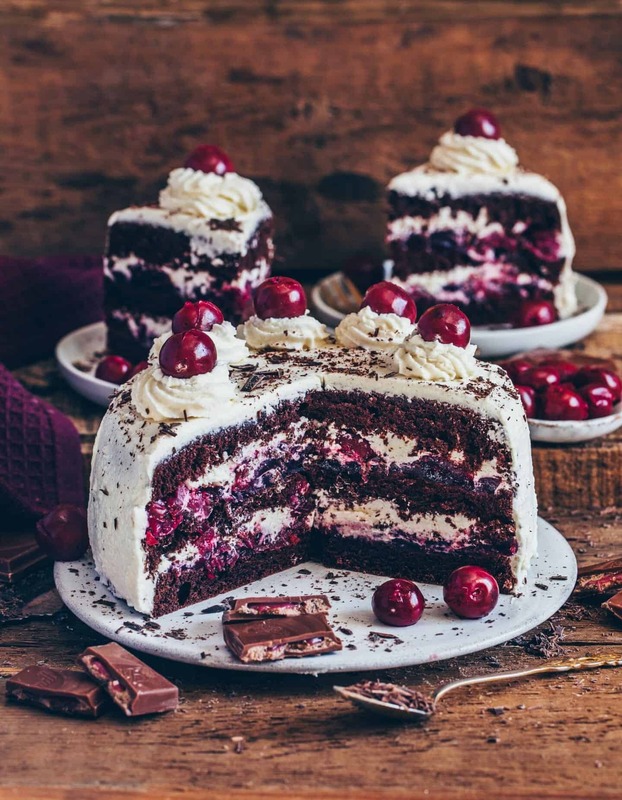 You can either freeze the entire cake or in single pieces. I prefer to freeze it in single pieces. You can put a piece of baking paper between each slice so they don’t stick together. This cake looks amazing and I would like to surprise my little boy for his birthday next month. I would like to make it with whipped coconut cream instead of soya based whipped cream and cream stabiliser. From your experience do you think it would work please. I’ve never tried using coconut cream, but you can do and let me know, if it worked. You could try using lemon juice instead. Great recipe, that doesn’t require ingredients that are hard to find and not so complicated to make. The cake turned out just as good as a non vegan one,if not better :). Will totally make again. Vielen dank Bianka, for such an awesome recipe! I made the cake recipe! It was so easy and delicious!! Thanks Bianca for sharing your recipes with us! Now I know how to make sweet life for my family! Thank you so much for what you do! That’s amazing! I don’t see the stabilizer you used linked anywhere, could you tell me which one it is? Mein erster Versuch, um eine Torte zu backen. Die Sahne-Creme hat nicht so richtig geklappt, sodass das Endergebnis nicht wirklich wie gewünscht aussah, aber sie hat einfach nur wunderbar gut geschmeckt! was hat denn bei der Creme nicht geklappt? Welche Schlagsahne hast du verwendet? Sie muss erichtig steif geschlagen werden und kalt sein.